Josh Copus' kiln yard, with both kilns firing simultaneously. I may have died and gone to woodfiring heaven. Last Tuesday I loaded up my Toyota Yaris with boxes of pots, camping gear, and firing attire and headed south of the border. The last week I have been participating in the Mountain PreHEAT Conference in North Carolina, where we've been loading and firing 8 different kilns at various towns in the larger Asheville area. I've been eating delicious food, taking afternoon breaks to swim in a beautiful river nestled in the mountains, seeing (and adding to my collection) a plethora of finely crafted woodfired pots from artists across the world, and spending hours and hours building a community over the mutual love of lighting things on fire, and continually stoking wood into a box for 3 days. The woodfiring process has become my most favourite part of my studio practice, for good reason. Aside from the love of lighting things on fire, and continually stoking wood into a box for 3 days, there is a deeply rooted sense of welcome and comfort around the firebox that lasts long after the kiln has been clammed up. I have made friendships this week that will last my lifetime, and have stretched my understanding on many of the various topics that come up at 4 in the morning. The front chamber of the Temple being loaded. Josh Copus, the lead organizer of the pre-conference, and a fantastically talented ceramic artist in Marshall NC, was the host for my "campsite" this week, and the owner of the most beautiful kiln compound I have seen in my life (and I would bet.. ever existed..). 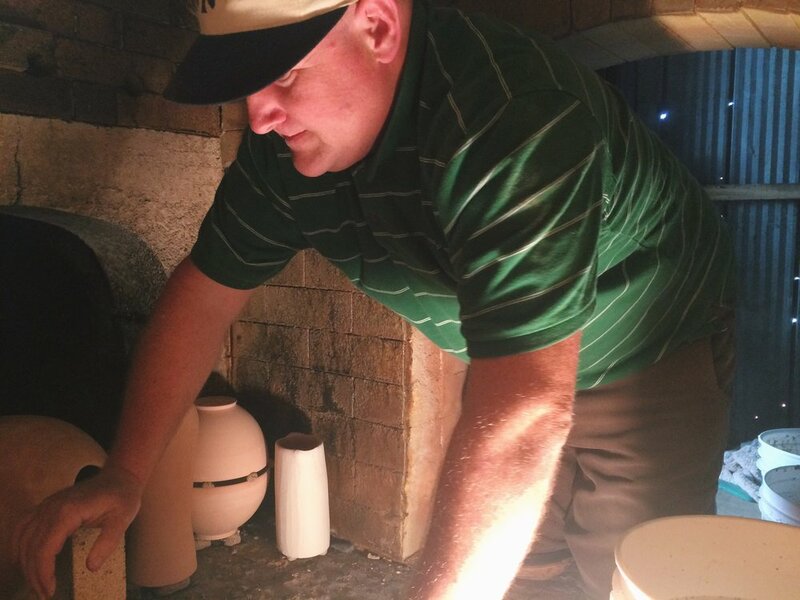 We simultaneously fired his 3-chamber climbing kiln "Temple", and his tunnel kiln "Landshark" for three days, while a third kiln "Turtle" was in process of completion. The energy at this place was phenomenal. At times there were 50+ people on the site, eating delicious woodfired pizza, drinking local beer and talking pots, while the two crews kept the kilns firing. And in the wee hours of the night, the rumble of the kilns and merry chatter of new friendships kept us sustained until daybreak. Fancy stairs for the side stoking area. Making it through the night shift. 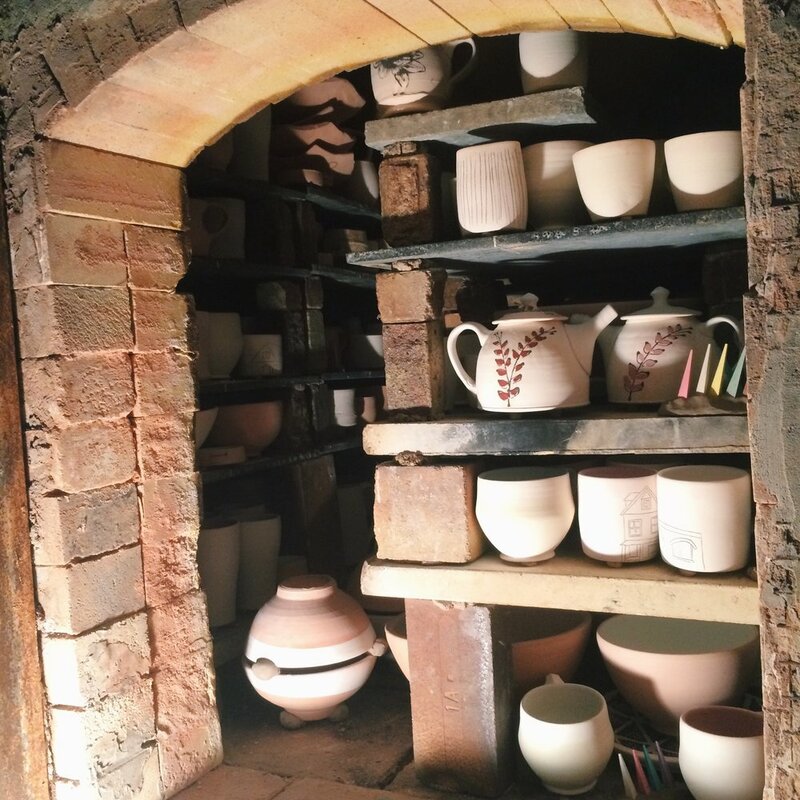 We'll be unloading the kilns on Monday, and I am so excited to see how the pots turn out. Until then, I'll be in Star NC at the International Woodfire Conference, attending panel discussions, watching demonstrations, attending many show openings, and likely, making more friends at the bar.